So this is what all the big name artists are doing now? Dropping music without announcements? Rihanna did just that last night. I go to bed a little earlier only to wake up and find she's released a "first glimpse" of her new music. This happens to be a track about wilding out on someone, in collaboration with Kanye West, and Beatles legend Paul McCartney (who doesn't sing on the song but contributes guitar). 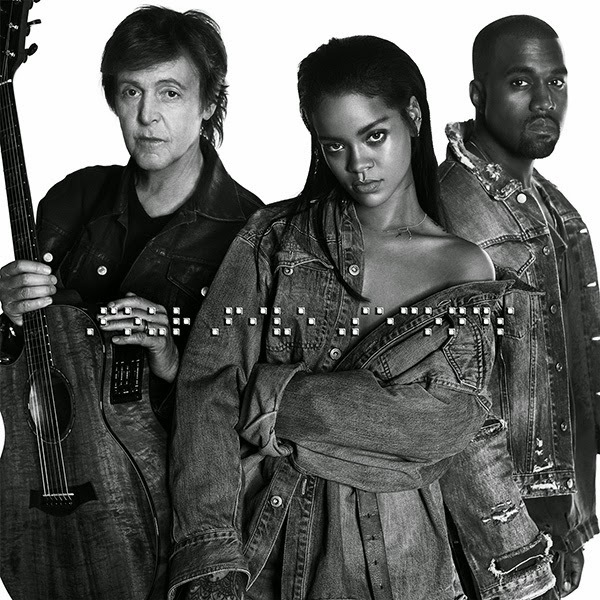 As far as direction goes, ‘FourFiveSeconds’ is boldly very different for Rihanna. No one was expecting her to release an alternative/hipster/folk/rock song with acoustic guitars. The meltdowns are hilarious. I don't really like the song and it does not have the massive 'first single' vibe you normally get from a Rihanna single. I might have liked it if it was laced with an actual beat. I hope this is just a buzz track, hence the "first glimpse" statement. It's very much a grower at this point. I feel that her vocals are very strained especially during the bridge sections. She sounds decent on the hook and verses, but Kanye was not needed for this. Yes, I can hear some vocal improvement and I like the rawness, but she's clearly trying to take her range beyond places it can go. I commend her for trying to push the boat with her music, but I will wait for the next single. The song was released to iTunes via Roc Nation and Rihanna’s own company Westbury Road Entertainment (FYI: Rihanna grew up on Westbury Rd). Oh, good play with the automatic iTunes release, because Ciara's 'I Bet' is still walking around lost in the park.